If you’re reading this, you’ve already caught a glimpse of the new Pilsen website. We’ve been working on the launch of this new site for months and we’re very proud to welcome you to our new online home! In this first blog post, we want to let you know about many of the new features that are designed to enhance your website experience and provide more valuable content to current and future Pilsen customers . 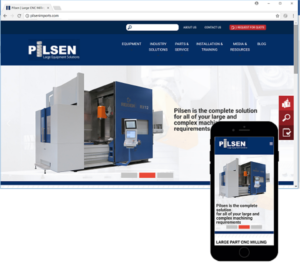 . .
You’ll want to check out our new large part machining “Industry Solutions” section that shares 5 case studies and features Pilsen’s expertise in the following large part manufacturing areas . . .
We hope you’ll explore more of our website to experience all of this new content for yourself. And when you do, please feel free to contact us and let us let us know what you think about the changes we’ve made.